Update 2/15, 12:30 p.m.: We published this story Feb. 13. On Feb. 14, Roblox unbanned PewDiePie. 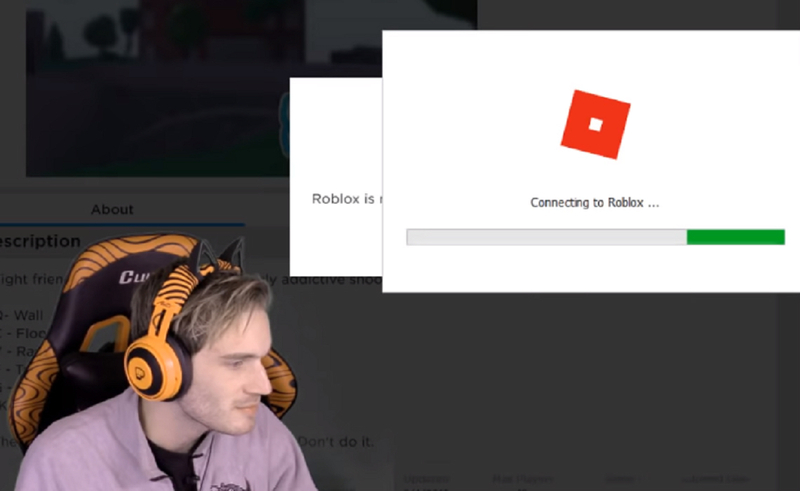 Video game platform Roblox has banned PewDiePie. Roblox is a massively multiplayer online game that lets users create their own games and digital worlds that are open for other users to come hang out in and play. On Sunday, PewDiePie (real name Felix Kjellberg) livestreamed his Roblox gameplay to YouTube in an attempt to increase his number of subscribers on the world’s largest video sharing site and prevent — for now — longtime rival T-Series from becoming the No. 1 most-subscribed YouTube channel. Kjellberg has been staying just ahead of T-Series for the past several months. 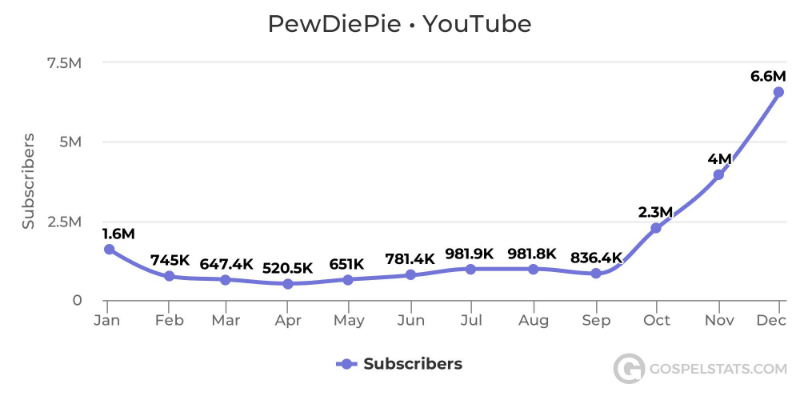 Here are his monthly subscriber numbers over the past year. 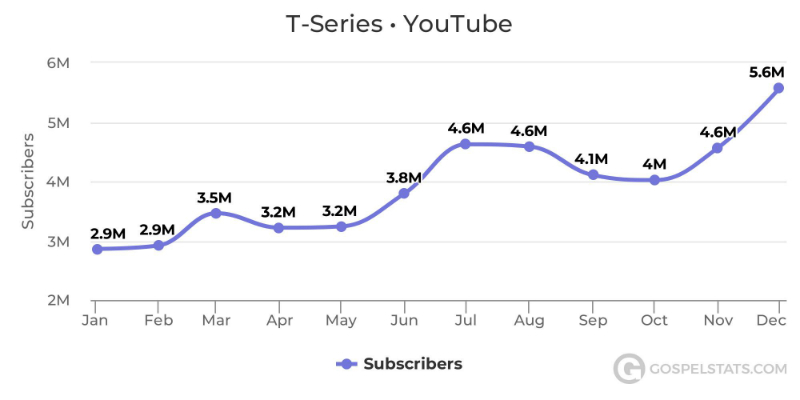 T-Series saw a massive climb in subscribers over the course of 2018. Here are its monthly subscriber gains for the year. If you’re thinking that doesn’t contain anything immediately suspect, you’re not alone. One YouTube commenter pointed out that maybe, at a stretch, the word “die” had set off red flags for family-friendly Roblox. However, when a Roblox staff member commented on the ban, they mentioned an entirely different reason for axing him, per Dexerto. “PewDiePie is no longer permitted on Roblox due to his content redirecting to unsafe and inappropriate sites/channels, as well as continued inappropriate behavior,” they said. That last one is likely what got Kjellberg the boot, since he swore throughout his livestream. 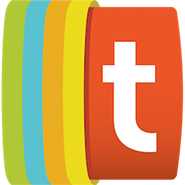 Tubefilter has reached out to Roblox for comment and will update this story with any new information. As for Kjellberg’s Roblox content redirecting to “unsafe sites,” it’s possible the Roblox mod is referring to his YouTube channel. Kjellberg has come under fire numerous times for content on his channel, most notably in 2017, when he hired two men on freelance site Fiverr and paid them $5 to hold up a sign saying “Death To All Jews.” (The video containing that incident has since been deleted.) He’s also said the n-word on a stream and, most recently, recommended his subscribers support an anti-Semitic, white supremacist YouTube channel. Kjellberg’s overall response to the incident is characteristically nonchalant. He’s branding it as an “oopsie” on Roblox‘s part, and moving on. You can see his vlog about the ban below.